Our certified arborists can access any tree with our specialised equipment and expert climbers! Talk to a specialist today. Tall Timbers Tree Services’ arborists are certified in the art and science of preserving and maintaining trees. Our certified arborists can access any tree with our specialised equipment and expert climbers! Tall Timbers Tree Services was founded in Sydney in the early 1990s by Phillip Couzal. We are proud to say that we should be your first line of experts to call when it comes to anything tree or stump related in Sydney. We have over 20 years of tree management experience and offer a superior service and knowledge of all aspects of the tree services industry. 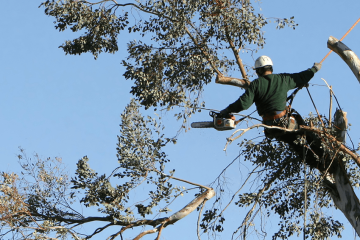 Tall Timber Tree Services hires arborists directly, which means that you will always be dealing with a trusted and qualified employee of the company. We are pleased to offer our tree services all around greater Sydney. We have years of experience and tenure in tree services all over Sydney including, Northern Sydney, St Ives, Ryde, Pymble, Lane Cove, Hornsby, Oatlands, Homebush, Croydon, Strathfield, Ashfield, Canterbury, Parramatta, The Hills, South Coast... We cover almost all off Sydney. Our skilled professionals work with the latest state-of-the-art equipment and techniques which are reliable and allow your job to be completed safely and efficiently. No one in Sydney understands trees and has the knowledge that we do about such a wide variety of tree species, both native and non-native. Being deft climbers, our fully qualified arborists can access restricted and difficult spaces easily and with as little impact to the surrounding area as possible. In return we can guarantee excellent service, superior knowledge and expertise, a safety compliant job and a 'no regrets' policy. We are the best in the business, we have specialised skill, knowledge and expertise in these areas and can provide you a top quality service at an affordable rate. We’re so happy that we selected you to cut down and remove a very large River Birch and to trim and shape another. Your personnel were very efficient, polite, technically competent, well organized and completely dedicated to our total satisfaction.